This Friday evening, Feb. 22nd, the Shillelagh Club welcomes Sum of 3 to play our Happy Hour celebration from 7 til 9. Sum of 3 features Lance Doss, Paul Page and Michael Blue, who play the best in southern, country and classic rock, and maybe even some of their own tunes. Lance has toured extensively in John Cale’s band and his music has been featured in two films by Michael Moore, The Tonight Show and HBO’s “Last Week Tonight with John Oliver.” Paul has toured and recorded with numerous artists including John Cale, Dion, Gary US Bonds, Bo Diddley, Del Shannon, Ben E. King. He currently plays and records with Ian Hunter’s Rant Band and on the reunited Mott the Hoople tour. The kitchen will be open for business offering a terrific selection of your pub favorites. There is no cover charge and the Club is open to the public, so all are welcome! This entry was posted in Happy Hour / Entertainment on February 20, 2019 by shillela. This Friday, Feb. 15th, the Shillelagh Club welcomes back Thousand Mile Stare to play for our Happy Hour from 7 until 9. TMS celebrates acoustic roots music from Galway to Galveston, from Kentucky to Killarney, from Belmar to Ballybeg. TMS plays folk/country/roots rock (usually called Americana these days) with a lotta 2 and 3 part harmonies. The group features Bill Karcher (from the Flemtones) on guitar, mandolin, vocals; David Sobel – guitar, banjo, vocals; and Tim Kennedy – 6 and 12 string guitar, harmonica, vocals. The kitchen will be open for business, offering a terrific pub menu and specials. As always, the Club is open to the public and all are welcome! This entry was posted in Happy Hour / Entertainment on February 15, 2019 by shillela. This Friday, Feb. 1st, the Shillelagh Club welcomes back the 4th St. NiteOwls to play our Friday evening Happy Hour celebration. The 4th St. NiteOwls are a 4-piece ensemble that performs an extensive repertoire of 1930’s prohibition jazz classics, inspired by Thomas “Fats” Waller, Louis Armstrong, Hoagie Carmichael and Cab Calloway. The group features Dave Rubin on arch top guitar, Jerry Fabris on upright bass, Megan Slack Burleyson on snare & vocal and Dale Dale Stephen Burleyson on arch top guitar & vocal. 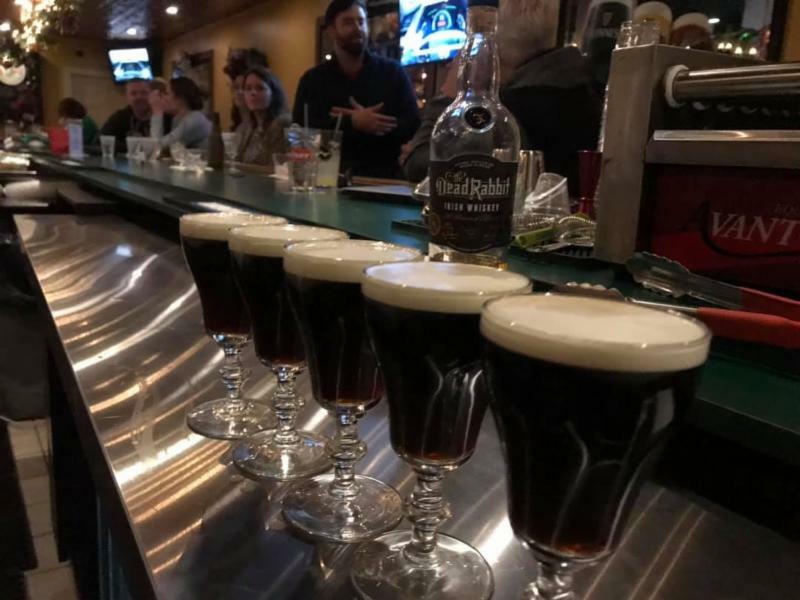 The kitchen will be open and offering some great pub favorites and as always, the Shillelagh Club is open to the public and all are welcome! This entry was posted in Happy Hour / Entertainment on January 30, 2019 by shillela. Blues Jam at the Shillelagh Club this Saturday! This entry was posted in Happy Hour / Entertainment on January 24, 2019 by shillela. This Friday, Jan. 11th, the Shillelagh Club welcomes The Hardcases-Solo Acoustic Entertainment to play our weekly Happy Hour celebration from 7:00 until 9:00. The Hardcases features Scott Heath, a multi-instrumentalist and member of those veteran Irish pub rockers, The Skels. Scott plays a wide range of cover songs and even a few originals, arranged for a variety of instruments. The kitchen will be open and there’s no cover charge, so bring your friends! The Shillelagh is open to the public and all are welcome. This entry was posted in Happy Hour / Entertainment on January 8, 2019 by shillela. The kitchen will be open offering a great menu of pub favorites. So come on out and enjoy a drink, a meal and some great music. The Club is open to the public and all are welcome! This entry was posted in Happy Hour / Entertainment on December 20, 2018 by shillela.